A panel presentation held Saturday at Petersen Automotive Museum in Los Angeles represented what I consider to be three of the pillars required for advanced vehicle technologies to succeed – commitment from engineering, automakers, and government policymakers and regulators. “Autonomous Car Symposium” featured Richard Mason, a senior engineer at the RAND Corp. who led the Golem Group garage team in building three test vehicles for the DARPA Grand Challenge for Autonomous Ground Vehicles. Jason Schulz, partnership manager for Toyota’s 21st Century Business Partnerships group, leads a team to research, identify, and leverage new technologies and partner companies. Bernard Soriano, deputy director at California Department of Motor Vehicles, is in charge of the department’s autonomous vehicles program. The three panelists discussed where autonomous vehicles stand, and how these three pillars view what’s coming up on the landscape. Autonomous, driverless vehicles have been witnessing an onslaught of attention and debate in the past two months, with Google announcing that it may very well build its own driverless cars; and for the next two years will be testing its self-driving pods. A study was released this month by IEEE based on a survey of more than 200 engineers, researchers, and academicians; they believe 2030 to 2035 is a more realistic timetable for when autonomous vehicles will see the light of day. The Association for Unmanned Vehicles Systems International and the Transportation Research Board hosted the Automated Vehicles Symposium 2014 in San Francisco this month. Continental and Bosch were two of the conference sponsors; these major suppliers have been playing a prominent role in testing and developing autonomous vehicle technologies. Nissan added to the autonomous vehicle dialogue with a more detailed description of what the automaker will be rolling out in the next few years. Mason has been part of seeing autonomous vehicles evolve from a student robotics project to becoming something very similar to what Google has been testing in recent years with its driverless Prius fleet. The 2003 Off-Road Robot Rally didn’t produce much; the Golum Group only made it five miles on the desert road test in its pickup truck; Carnegie Mellon University, which continues to play a leading role in testing these vehicles, had the best results at seven miles on that trip. Things got better in 2005, where the Golum team had a video camera onboard its Ram pickup and was able to practice obstacle avoidance, and reached the top speed in that year’s competition of 47 miles per hour. The truck eventually lost its memory and ran off the road. In 2007, the Golum team raced a much more capable vehicle – a converted Prius — which offered a look at the self-driving car of the future, Mason said. Schulz gave voice to a perspective expressed by several automakers – autonomous vehicles are part of the overall role-changing identity taking place in the auto industry. For Schulz, autonomous vehicles represent a major shift for vehicles and automakers, but they’re not the only thing. His presentation discussed Toyota’s role in hybrid systems and alternative fuels, specifically the hydrogen fuel cell vehicle that Toyota is rolling out a year from now. Schulz talked about Toyota’s Advanced Active Safety Research Vehicle (AASRV) being test driven near the Toyota Research Institute in Ann Arbor, Mich. Toyota has been participating in a huge research vehicle-to-vehicle (V2V) study with other automakers involving about 9,000 vehicles and organized by the University of Michigan at Ann Arbor. He also mentioned the Driver Awareness Research Vehicle (DARV) introduced last year at the LA Auto Show. These studies tie into Toyota’s mission of making contributions to vehicle safety, mobile applications, and advanced technologies, Schulz said. Soriano described the challenges that California faces overall in transportation – 32 million vehicles registered in the state and 323 billion vehicle miles driven per year. The nation has been seeing about 32,000 fatalities in vehicle collisions each year; and traffic congestion and wasted fuel consumption are factors influencing interest in autonomous vehicles. The state government has been receiving input from residents on their opinions on autonomous vehicles; the top concerns have been liability and “driver” definition – how will the driver be defined for responsibility in the event of a crash and how does the DMV determine who would be assigned with violating state vehicle codes; privacy issues – who owns the data and how is it used; and cyber security, Soriano said. Soriano has been part of legislation taking shape and being adopted by regulatory agencies in California. He sits in on a statewide steering committee for Senate Bill 1298, which is setting the structure for California’s autonomous vehicle testing and deployment rules that will be released by the end of this year. The National Highway Traffic Safety Administration (NHTSA) participates in these meetings along with state agencies: California State Transportation Agency, Department of Insurance, California Highway Patrol, Office of Traffic Safety, California Department of Transportation, and the Department of Motor Vehicles. NHTSA is years away from releasing federal regulations, but last year it did release guidelines with five levels for defining each type of autonomous vehicle; Level 0 is no automation; Level 1 is function- specific automation (typical of what we’re using right now in vehicles, such as cruise control); Level 2 is combined function automation; this level involves automation of at least two primary control functions operating in unison, such as adaptive cruise control in combination with lane centering. Level 3 is limited self-driving automation, which says that the vehicle can operate by itself in most situations – the driver may need to take over the car when approaching a construction zone, for example. Level 4 covers full self-driving automation. In Level 4, the vehicle is designed to perform all safety-critical driving functions and monitor roadway conditions for an entire trip. Most of California’s regulations cover Level 3 and Level 4, Soriano said. As part of California’s SB 1298, the manufacturer testing standards were approved by the legislature in May and go into effect in September. The state has committed to passing through the second part by the end of this year covering deployment of the vehicles to owners, and rules for operating the vehicles on roads. When a company tests an autonomous vehicle, they’re usually trying out LiDAR sensors mounted on the car’s roof, radar, cameras, and GPS. Mason said that the advanced sensors that autonomous vehicles require are currently pretty expensive. It’s not yet known how much a driverless car will cost in the future; while a recent JD Power and Associates study found that consumers are willing to pay about $3,000 more for this new technology, it’s likely to cost them more. Bernard said that one issue being followed is how autonomous vehicles can bring mobility back to people who’ve lost use of their vehicle due to factors such as disabilities. Another advantage of driverless cars, as vividly presented during an Audi commercial, is a self-parking system. You can step out of your car and it will find a space and park itself; when you’re ready to leave, you pull out your smartphone and call the car to come and pick you up. People in the audience seemed to really like that perk. There should have been one more chair on that stage. The fourth pillar could have been represented by an executive from a technology supplier such as Google, Continental, or Bosch. Google is playing the leading role on moving driverless cars forward, but Continental, Bosch, and other technology giants and Tier 1 suppliers have been quite active in testing projects in the US and Europe. The closest I’ve ever come to a General Motors EV1 was while walking through an exhibit at Petersen Automotive Museum in Los Angeles on Saturday. It was part of the Alternative Power: Lessons from the Past, Inspiration for the Future display, and it showed a 1996 EV1 that somehow looked very familiar to me. 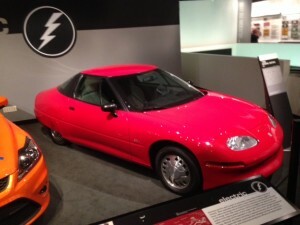 While there were 1,117 of these EV1s manufactured by GM, there are only about 40 of them left. “Who Killed the Electric Car?” was presented as a mystery story and finished up depicting GM as the villain. For reasons unexplained by the automaker in the film, GM took back the cars and crushed them. That took place soon after California relaxed its zero-emission vehicle sales mandate; GM and other automakers had introduced a limited number of EVs in the state and backed away from it after the state’s decision to relax the mandate. The EV1 had been leased from about 1998 to 2003 through Saturn dealers, and had been loved by several of its lessors – including actors Tom Hanks and Danny DeVito. The two-seater was considered by some people to be the most sophisticated electric car ever built. As you can see from the photo taken at the Petersen museum display, it had a space-age look that stood out on roads. The EV1’s lead-acid battery was about four times as heavy as the lithium-ion battery pack used in the Chevrolet Volt. The EV1 had a driving range of 60 to 80 miles. EV fans had been building their own do-it-yourself original and conversion EVs since the 1960s. The EV1 represented a new era in EV history when major automakers like GM gave them a shot. That effort failed and it took about eight more years for GM to build another plug-in EV model – the Volt. The US Department of Energy is now offering $4.5 million more in funding for alternative fuel vehicles through Clean Cities. 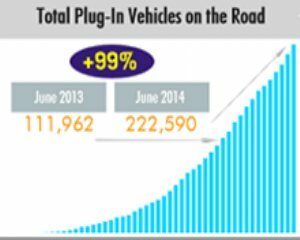 The goal is to increase consumer outreach, training, and strategic planning; technologies and fuels include plug-in electric, natural gas, propane autogas, and flex-fuel vehicles. Concept papers to apply for funding are due the beginning of next month, Aug. 1, 2014. Areas of focus are on-the-road demonstrations, safety-related training, and emergency preparedness. Read more about the announcement and find the link to apply for funding here. A long-awaited announcement came out last week on a more price-competitive model from Tesla Motors. Starting in 2017, Tesla’s Model III car will be introduced with a starting price of $35,000. That model will follow the upcoming Model X crossover and is thought to compete directly with the BMW 3 Series. It will be the first time Tesla enters the market somewhere between the Chevy Volt and Nissan Leaf in starting prices. Tesla CEO Elon Musk said it will get 200 miles on a full charge, and will be about the same size as the BMW 3 Series. The US Environmental Protection Agency may be rethinking fuel economy ratings. Automakers may have to road test their vehicles to verify mileage claims posted on window stickers, according to a proposal being considered by the EPA. The EPA is requesting more accurate information in the wake of Ford, Hyundai, and Kia overstating fuel efficiency on some of its models. “Some automakers already do this, but we are establishing a regulatory requirement for all automakers,” Chris Grundler, director of the EPA’s Office of Transportation and Air Quality, told The Wall Street Journal. Google Earth Outreach is working with Environmental Defense Fund to map out natural gas leaks under the streets of Boston, Indianapolis, and New York City’s Staten Island. Google is providing cars and drivers traveling streets to measure leaking natural gas, which is mostly methane, through its Google Street View mapping; along with sensing and analytical technologies to measure environmental indicators. Two years ago, the California Air Resources Board launched a mapping tool using Google Earth that allows users to locate major sources of greenhouse gases and examine the emissions of each facility. Along with Street View and driverless car technology, another recent move by Google was a $500 million acquisition of Skybox Imaging in June. Skybox Imaging provides commercial high-resolution satellite imagery, high-definition video, and analytics services. It will be interesting to see where Google is going with telematics, mapping, and autonomous vehicle technologies. Level 2 charging will grow 14-fold by 2020, says research by GlobalData. The market could grow from $67 million in revenue this year to $947 million by 2020. The American Recovery and Reinvestment Act has provided attractive incentives for electric vehicle (EV) charging stations installations, according to the study. LG Chem is working on second-generation batteries for electric vehicles that can travel more than 200 miles per charge when it comes out in 2016. The battery maker, based in South Korea, currently supplies batteries for General Motors, Renault SA, and other automakers. The Government Car Service in the UK is considering a few Tesla Model S deliveries to transport officials. The government has dedicated 5 million pounds ($8.6 million) for the program designed to buy more than 150 ultra-low emission vehicles. Volvo is setting up a global partnership with ABB to co-develop and commercialize electric and hybrid buses along with fast charging systems. Their first project will be the implementation of Volvo electric hybrid buses and ABB’s automatic e-bus chargers in the Luxembourg public transport system; 12 Volvo Electric Hybrid buses will be running on existing lines by 2015. Tesla Motors offered a $10,000 prize at a hackers conference for any one of them that could hack into a Model S. Chinese hackers at the SyScan360 conference in Beijing say they’ve found a vulnerable entry point. A post on the social network Weibo said that the IT department from Chinese company Qihoo 360 Technology Co had been able to take control of the car’s door locks, horn, headlights and sunroof. Tesla Motors has promised to fix any “legitimate vulnerability” to the Model S.
Student Transportation Inc.’s 435 school buses operating in Nebraska’s Millard and Omaha public school district were able to gain cost saving of $5,000 per day switching over to propane autogas. That data comes from a one-year test program. The buses travel between 100 to 150 miles per day for an average of about 50,000 miles each year, as was learned during the one-year test program; that equates to about 4.2 million fewer pounds of carbon dioxide being released after switching over to propane. The smartest way to increase sales and market share for electric and other green vehicles is proving that they can deliver three benefits: being cost effective; convenient for the user’s lifestyle; and reducing emissions along with petroleum dependence. Just take a look at websites and ad campaigns on Youtube for the Nissan Leaf, Chevy Volt, Tesla Model S, and other models. Those making the vehicle acquisition decision must be convinced on all three levels – but sometimes it’s not enough to nudge the purchasing decision. The question always comes up: What’s the best way to make the case that buying a green vehicle instead of a fuel efficient gasoline-engine model is the best way go? As several marketing experts have stated, logical reasons for making the purchase decisions will ride in the backseat. The emotional, personal decision will drive the decision; and that’s the case for personal, business, and fleet vehicle acquisitions. Personal opinions and viewpoints will vary. An environmental group leader that I know is proud to drive a Tesla Model S, has native plants in her front yard that need little water, and believes it’s important for government and industry to take environmental issues seriously. She’s very concerned about the harmful effects of hydraulic fracturing (“fracking”) for natural gas and its impact on the environment. On the other hand, she thinks that natural gas vehicles utilized in a fleet is a very good, clean way to go. Both of these people were passionate in sharing their opinions on sustainability issues, though their assumptions have been different. Diversity in opinions on environmental and sustainability issues is another marketing theme that needs to be addressed. For example, while speaking out against GMOs (and Monsanto) is top priority for a lot of people, for others it’s not a concern – or for them it’s so pervasive in most of the food we buy at grocery stores that you’d have to go to extremes to avoid GMOs, such as growing all your own food or only buying organic foods. Other Americans will prioritize the Keystone XL pipeline as the leading issue, and for others fracking must be stopped. Consumers most concerned about climate change generally have strong opinions on some or all of these issues. For other consumers in the US, environmentalists are seen as being extreme and too far to the left; they may value conservation, clean air, and job creation, but don’t support an all-encompassing paradigm such as climate change. Authenticity and social responsibility seems to be valued by most consumers. As covered recently by experts during a GreenBiz webinar, transparent, honest, and accurate reporting is being expected by consumers and in the business-to-business (B2B) environment. As panelists discussed during “Understanding the B2B Green Marketing Landscape,” B2B companies are especially demanding – requesting unprecedented amounts of information about products’ environmental and health attributes. Sustainability is one of the top values influencing opinions by individuals and businesses (according to several studies in the past five years), and it’s been tied firmly to ethics and social responsibility. The point being made here is that frequently-asked questions about alternative fuel vehicles need to be addressed by salespeople and through educational materials. It’s probably a good idea to take a broad viewpoint on sustainability and environmental issues when marketing these vehicles. It’s even more important to offer a hands-on, emotional experience to vehicle shoppers. That’s likely to come to them while test driving the vehicles, having conversations with experienced owners of these vehicles, and connecting the vehicles to environmental and economic issues that they’re passionate about. If buying and driving an EV, hybrid, or other alt-fuel vehicle brings feelings of community service, fulfillment, and practical gains, a lot more of these vehicles will be sold. If you’ve spoken lately with students and 20-something Millennials, or with their parents, you may have heard about their interest in robotics for career opportunities – in engineering, management, public policy, computer sciences, and academics, among other fields. For those interested in finding out about the 10 best American universities to attend for education in artificial intelligence and robotics, check out this Business Insider article. Career opportunities and realities are changing and will continue to do so for young people – and for older people from the Baby Boomer and GenX generations. Robotics is being introduced in several industries now, with the US Dept. of Defense (DOD) leading the way. Armed drones have been flying over Iraq lately to protect US military personnel assisting Iraqi forces from the unexpected uprising; unmanned ground vehicles continue to be tested as well. Lessons learned by the DOD eventually disseminate onto university and government research labs; there’s a growing demand for workers who can act as service technicians for robotics, along with those trained in designing and managing the next generation of robotic technologies. Automotive executives from Nissan and a few competitors attended the Automated Vehicles Symposium last week; Nissan reiterated a bold statement – it will be the first automaker to roll out an autonomous vehicle by 2020. Daimler AG chief executive Dieter Zetsche said his company will have more to say about the next steps “in the not-too-distant future.” While it will take a few years longer than 2020 for autonomous vehicles to spread across US highways, the implications are huge for people making their living driving a car. While speaking this spring at an economic think tank hosted by the American Enterprise Institute, Microsoft CEO Bill Gates said that within 20 years, a lot of jobs will go away and will be replaced by software automation (“bots”). “Software substitution, whether it’s for drivers or waiters or nurses … it’s progressing. … Technology over time will reduce demand for jobs, particularly at the lower end of skill set,” Gates said. 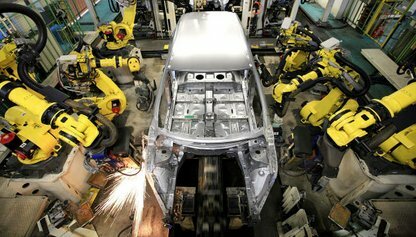 Auto assembly plants will see jobs go away as robotics take their place. Last year, BMW took a step in that direction with a handful of robots working side-by-side with human workers at its Spartanburg, SC, plant. For those employed as drivers – such as taxi and limo drivers, shuttle services, and commercial trucks – robotics and autonomous vehicles will mean job loss. As for today, growth in ridesharing is pushing fear factor buttons. As Uber, Lyft, Sidecar, and other companies make ridesharing services booked on mobile devices easier and more plentiful, taxi and chauffeured transportation drivers are starting to feel the pinch. Ridesharing and carsharing are starting to change the business model for transportation companies and automakers. Intelligent transportation systems, connected cars, and autonomous vehicles are in the works. As Bill Ford, executive chairman at Ford Motor Co., says, there’s a radical shift taking place over the next 20 years: automakers will become personal-mobility companies. The fast-changing work environment presents challenges and opportunities for everyone. Robotics is one of several technologies impacting job retention and creation, but I think there are several other factors to continue monitoring and preparing for……. Next-generation lithium batteries used for electric vehicles and consumer electronics. Tesla Motors is moving forward on an ambitious lithium battery factory subsidiary, and several other major automakers are investing heavily on battery R&D. Mobile devices on smartphones and tablets – people around the world are becoming more dependent on their mobile devices all the time and expect more applications to be delivered. Android Auto is a good example of major technology companies like Google partnering with automakers. Ridesharing and carsharing services are in their early phases but seem to be finding a lot of users in Europe and the US, with other markets like India starting to show interest; automakers and car rental companies know this very well and are getting into the business. Robotics and artificial intelligence need a trained workforce – for autonomous vehicles, factory production, testing labs, cargo container management, and many other applications. As high school and college students and workers are discovering, it does make a great deal of sense to prepare for the future and gain job skills in advanced technologies. Does the layout of Green Auto Market look different to you? It did change over last week using a new template on WordPress; it’s designed to be more responsive to mobile devices like the iPhone, Android, and iPad. I do like reading e-newsletters easily from my phone, and have had that request made by a few readers. You should also know about two new social media sites for Green Auto Market — @GreenAutoMkt on Twitter and a new Companies page on LinkedIn. Some people are getting a lot out of Google+ and Facebook with its 1.5 billion users; as for me, Twitter and LinkedIn make the most sense for connecting with interested and like-minded people. China is a huge, important market to enter, but watch out for trademark infringement lawsuits. Zhan Baosheng said he registered the rights to the Tesla name before Tesla Motors entered the Chinese market. In the filing, Baosheng requested that Tesla shut down its showrooms, service centers, and superchargers; plus stop all sales and marketing activity in the country and pay him about $3.9 million in compensation. Clean diesel cars continue to grow in popularity with US car buyers – sales increased by 25% during the first six months of this year. Sales increases seem to reflect the number of diesel vehicles now available to consumers – 27 cars and SUVs, nine vans, and 10 pickups come in diesel engine versions to the US market. Getting great mileage through advanced technologies like turbocharged direct injection (TDI) seem to be helping, too. Comments filed by an impressive list of NPOs called for several changes to the Federal Trade Commission’s Fuel Economy Advertising Guide. American Council for an Energy-Efficient Economy, Center for Auto Safety, Consumer Federation of America, Consumers Union, Natural Resources Defense Council, Public Citizen, Safe Climate Campaign, Sierra Club, and Union of Concerned Scientists joined together on the comments. The groups called for the US Environmental Protection Agency (EPA) miles per gallon ratings to be included in passenger vehicle advertising, the banning of anything but EPA ratings in ads, and outlined the most effective ways to present MPG ratings. Sandia National Laboratories released a study finding that a larger network of hydrogen fueling stations may soon go live. The study says that 14 of the 70 California gas stations reviewed for integration of hydrogen into existing gas stations can accept hydrogen fuel now; an additional 17 stations could accept hydrogen with property expansions that would comply with National Fire Protection hydrogen technologies code. Propane Education & Research Council (PERC) is hosting a webinar on July 17th at 12:00 EST. ROUSH CleanTech will provide the guest speakers discussing the usage and success of propane autogas; how switching can benefit your industry; and how to conduct proper use and handling, maintenance, and service requirements of propane autogas vehicles. 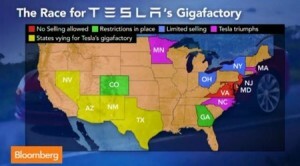 Tesla Motors now can officially sell its cars in the state of Pennsylvania, now that Gov. Tom Corbett has signed the bill into law. Tesla had been battling with dealer associations, and eventually both the state House and Senate voted to allow Tesla to open up to five retail stories in Pennsylvania. Nissan is taking on Tesla Motors CEO Elon Musk on how charging should be paid for. “No Charge to Charge” program is being expanded by Nissan, from about 10 US markets to more than 25 by next June, with the possibility of more in the future. New Leaf buyers can join the program and get two free years of charging at any participating station, many of which will offer DC quick chargers. It’s being carried out through a partnership between Nissan and PlugShare. “No Charge to Charge” is using PlugShare’s charging station locator and EV driver community app with participating stations.10. The US Environmental Protection Agency may be rethinking fuel economy ratings — automakers may have to road test their vehicles to verify mileage claims posted on window stickers. The EPA has a proposal requesting more accurate information in the wake of Ford, Hyundai, and Kia overstating fuel efficiency on some of its models. “Some automakers already do this, but we are establishing a regulatory requirement for all automakers,” Chris Grundler, director of the EPA’s Office of Transportation and Air Quality, told The Wall Street Journal. “With a growing global population and greater prosperity, the number of vehicles on the road could exceed two billion by midcentury. Combine this with a continuing population shift toward cities, with a projected 54% of the global population in cities by 2050, and it becomes clear that our current transportation model is not sustainable. Our infrastructure cannot support such a large volume of vehicles without creating massive congestion that would have serious consequences for our environment, health, economic progress and quality of life.” — Bill Ford, Executive Chairman, Ford Motor Co.
Bill Ford’s comments, which you’ve just read, were featured recently in The Wall Street Journal’s 125th anniversary issue where leaders were asked to predict what’s coming up. Ford is in a unique position in the auto industry – being the great-grandson of Henry Ford, who “redefined mobility for average people,” along with articulating bold, forward-thinking ideas on where automakers need to go in the next 20 years. Bill Ford understands the inner working and challenges faced by global automakers in moving forward, along with the market dynamics that will likely cause automakers to transform their identities. Space-efficient vehicles that run on gasoline or alternative energy sources. Beyond the energy fueling the vehicles, Ford says that using materials and manufacturing processes committed to sustainability are very important. Aluminum is a good example, as is carbon fiber, in approaching the life-cycle supply chain from a new perspective. Cars will need to be able to interact with each other in a city’s infrastructure, networking with other transportation modes like trains, buses, and bikes. Ridesharing and carsharing companies like Lyft, Uber, and Zipcar symbolize a major shift in thinking – from individual ownership to transportation alternatives. 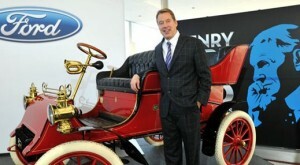 Bill Ford is a believer in connectivity – with “wireless communication, infotainment systems and limited functions for automated driving and parking” being of much importance. Autonomous driving is becoming possible, and is already starting to show up in technology features making cars safer and easier to drive. Beyond completely driverless cars, Ford says that some entrepreneurs are looking into the feasibility of flying cars. The auto industry has entered a new phase in its history. “The next 20 years will see a radical transformation of our industry, and will present many new ways of ensuring that my great-grandfather’s dream of opening the highways for all mankind will remain alive and well in the 21st century and beyond,” Ford wrote. The growing popularity of carsharing may be indicating that consumers are expecting more from the overall transportation experience, and that includes parking their cars. Green Parking Council (GPC) is supporting parking sustainability solutions through its Green Garage Certification program. The certification program offers a rating system defining and recognizing sustainable practices in parking structure management, programming, design, and technology. For those interested in qualifying for its certification program, or working with parking vendors active in the program, you can start with the Green Garage Certification Owner’s checklist to see if that parking facility is ready for move forward with certification. GPC is a nonprofit organization and an affiliate of The International Parking Institute that provides educational and technical services to parking professionals and to the public. GPC, led by Executive Director Paul Wessel, believes that garages of the future will support electric cars being powered by renewable, clean energy and guided by smart grid technology. Carsharing and intermodality are part of the group’s philosophy along with making parking garages convenient services and well-designed urban assets. 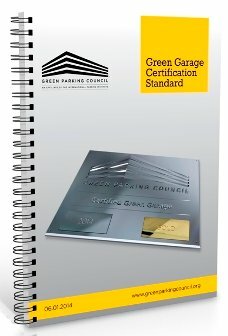 The Green Garage Certification’s standard is based on 48 elements including descriptions, options for achieving recognition, documentation requirements, and industry and reference standards. Certification is open to all types of structured parking facilities including commercial, university, municipal, hospital, retail, and hospitality. GPC also announced that it received a Clean Cities grant to survey parking operators and owners about alternative fuel vehicle use and interest. Parking operators in the Washington, DC, Virginia, and Maryland markets are participating in the survey. GPC will also be sharing information about its certification program, energy efficient improvement in lighting and ventilation, and its Lighting Energy Efficiency in Parking (LEEP) campaign. Those who would like to participate in the survey or receive more information can email Wessel or call 203-672-5889.
by Jon LeSage, editor and publisher, Green Auto Market Here’s my take on the 10 most significant and interesting occurrences during the past week……. 1. The Nissan Leaf continues to lead plug-in sales, delivering 2,347 units during June. While that’s 770 units lower than May’s best-ever Leaf sale volume, it set a record for June and was up 5.5% over a year ago. That makes for 16 straight months of record sales for the Leaf and deliveries up almost one third over the first half of 2013. The Chevrolet Volt saw an increase in sales in June versus May – 1,777 units sold versus 1,684. That was down from its best-ever June sales. Volt sales are stabilizing, but they are down about a third from the first half of 2013. Another interesting trend to watch is that the Ford Fusion Energi plug-in hybrid beat the Volt for the first time in monthly sales — 1,939 deliveries beat the Volt’s 1,777 units sold. Tesla doesn’t report its monthly sales, but it’s estimated to have sold about 1,200 Model S units in June. That’s much more than luxury electric car competitor BMW and its i3, which closed the month with 358 units sold. 2. Two drivers wreaked havoc in Los Angeles during separate incidents on July 4th, with both of them driving a Tesla Model S. A Tesla driver hit the back end of a Toyota Corolla at 10:35 pm on Highway 14 in Palmdale; three passengers in the Corolla were killed and two seriously injured while the Tesla driver suffered minor injuries and was released from the scene late Friday. One person was injured and is in critical condition after another crash on Friday morning in West Hollywood; the injured person may have been an unidentified driver who stole the Model S. The car had been stolen early Friday morning, most likely from the Tesla service center on the 5800 block of Centinela Ave. The driver led police officers on a wild chase, getting near 100 mph and eventually crashing in West Hollywood. The Model S collided with a light pole that split the car in half. The front half of the car caught fire after the battery pack was ignited. Prior to the crash, police officers chasing the Tesla crashed their police car near La Brea Ave. The two police officers were treated for minor injuries. Several other drivers were hurt in the Tesla crash, although it is still unclear how many. 3. Fleet managers are gaining more experience with electric vehicles and are making the business use case for acquiring them, says Morgan Davis of Electric Power Research Institute in this segment of our recent video interview. Check out the Plug-In 2014 website for more information on for the conference taking place later this month – July 28-30 in San Jose, Calif.
4. A webinar is being offered to learn about an important area for alternative fuels – emergency planning for communities hit with disasters. The National Association of State Energy Officials (NASEO) is presenting a webinar on July 17th at 4:00 pm eastern time to explore the benefits and opportunities of integrating alternative fuel vehicles in energy assurance planning. Panelists Linda Bluestein, National Clean Cities Director for the US Dept. 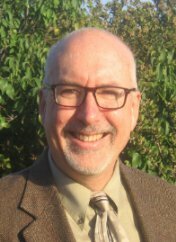 of Energy, and Jeff Pillon, Energy Security Director for NASEO, will help participants examine strategies to promote information sharing and stakeholder coordination among state energy offices and Clean Cities coordinators. To register for this webinar, visit this site. 5. Toyota Motor Corp. has requested a two-year exemption from a rule governing electric cars to clear the way for the company to sell its upcoming hydrogen fuel-cell vehicle in a petition to the National Highway Traffic Safety Administration. Toyota says that the federal rule, FMVSS No. 305, would render its vehicle inoperable. The rule requires automakers to isolate high-voltage parts in electric cars in the event of a crash. The company’s new fuel-cell car doesn’t fully meet this requirement because a mechanism for protecting against electrical shocks in lower-speed crashes would render its vehicle inoperable, Toyota said. Toyota has taken another approach to insulating the car’s high-voltage cables and surrounding components, and would like more time to work this out with NHTSA. 6. The Tesla Model S has taken yet another award – this time winning the annual Total Quality Index study issued by market-research firm Strategic Vision. The study is based on responses from 38,361 vehicle owners and “encompasses positive and negative product experiences including reliability, actual problems, driving excitement and other measures.” Earlier this year, Strategic Vision ranked the Model S the single “most-loved car” in the US. The Nissan Leaf also ranked high on that poll. 7. Tesla Motors heard some good news from the Pennsylvania legislature – the automaker has been given more approval in the state to directly sell its cars to consumers even though dealers have been objecting. Tesla will be able toincrease the number of stores in Pennsylvania and add more service centers. The bill that was already approved by the state senate would allow for as many as five retails stores in the state; it still needs to be signed into law by Gov. Tom Corbett. 8. Electric buses and trucks have secured more private funding. Proterra, a builder of electric municipal buses, has raised $30 million in fourth-round venture capital funding that was co-led by KPCB and GM Ventures. That makes for a total of $180 million raised with another $10 million expected to close in coming weeks. Motiv Power Systems raised $7.3 million for an electric school bus. Motiv provides a power train control system that can power a truck or bus chassis with commercially available battery packs and motors. 9. Hybrid electric vehicles used in commercial vehicles just lost a supplier. Eaton is exiting the market in North America for utility trucks and parallel drives for delivery trucks; that comes from weakened market demand, especially in the US, the company said. Contributing factors include expiring government incentives, a general stabilization in diesel prices, and the rise of natural gas as a heavy duty vehicle fuel. 10. Natural gas vehicles might be selling like hotcakes in China. About 3.8 million cars, trucks and buses in China will be fueled by compressed or liquefied natural gas by 2020, according to Bloomberg New Energy Finance. China is the world’s largest energy consumer and emitter of greenhouse gases; China would nearly double the number of its natural gas vehicles by 2020 as President Xi Jinping seeks to reduce smog.